Yesterday I wrote about a road trip with Ruby last fall, and since I've just purchased a new car (a 2014 Subaru Impreza - I'm a true Colorado Subaru girl) I wanted to protect those nice new seats from dog hair and dog claws. After much deliberation I chose the reversible Kurgo Loft Hammock seat cover. I felt a nostalgic pull toward the green color because it reminded me of the down sleeping bags we camped with when I was a kid, although I knew I would be more likely to use the grey side to better coordinate with my interior. 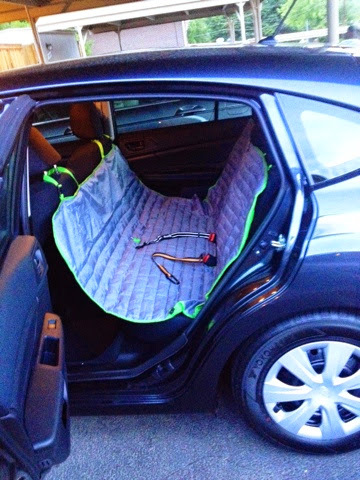 The seat cover arrived yesterday - just in time for a trip to visit my horse and the corgis tomorrow! It came in a cute little matching tote bag which I'm sure I can put to good use for dog supplies when we travel. The green is even brighter than I expected, so I definitely wanted that side down, but I love how the piping and straps contrast with the grey. It was very easy to install and the straps that go around the front and rear headrests have a lot of adjustability. The mini bungee cord that is supposed to loop around the front corners of the rear seats did not work for me, but this is to be somewhat expected for a "one size fits all" item. I wished that there were two zipper slots for the seat-belts instead of one long one, since I use safety harness tethers for the girls, but I understand that would make it less universal. The fabric is heavy duty, waterproof, and seems as if it will be easy to clean. 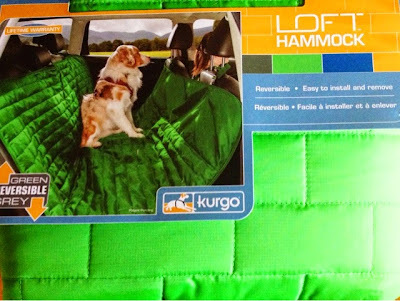 I like the fact that the backs of the front seats are also protected, and the hammock style will keep the dogs from standing on the armrest or jumping on the floor. Anything I store behind the front seats will be nicely covered. 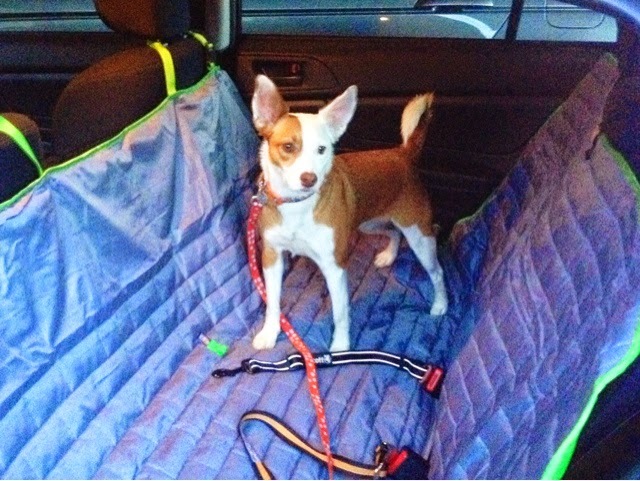 Although it changed the pristine interior of my new car (is anything pristine when you live with dogs?) I think the seat cover looks pretty sharp and will serve its purpose of keeping red and white hairs off of my upholstery and providing a comfortable, safe place for the girls to ride. 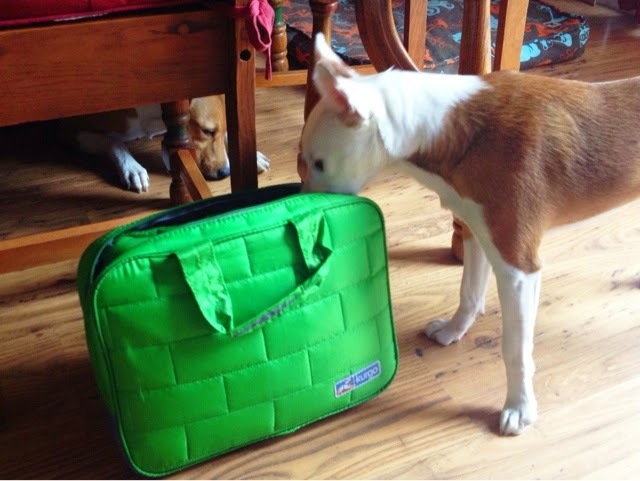 Ruby hopped in for some modeling and the ginger sisters will be traveling in style on our next trip! Disclaimer: I purchased the seat cover myself and Kurgo did not request or compensate me for this review. If you'd like one of your own, use code KURHAM20 for 20% off at Kurgo. But I suspect the hammock will work well for you. I got one to use when we rent a car and it has reduced my pre-drop off clean up to less than 15 minutes. Very nice. My car was old before we got Silas, and my husband's car has leather interior, so we haven't worried too much about covering the seats. (The real danger to the leather is me--in the summer I leave a film of zinc oxide on everything I touch.) I think Kurgo makes some really well thought-out car accessories in general. If your seatbelt fasteners are a real problem, you might try their zip-line rear seat restraint. We use it with Silas, and it's really nice. I have been looking at the zip-line, because Boca got tangled on our last drive and luckily it was in town so I was able to pull over quickly. The seat-belt slot isn't a huge issue, it just leaves a big opening for more hair to get on the seat itself. These short-haired girls are nothing like my two double-coaters, but one trip in my old car after I'd taken the blanket off the seat proved to be a big mistake - they shed more than I think! That looks like a really nice seat cover!! we have a seat cover in our car and we have found it to be really useful. the only thing with ours is that we found it to be a little slippery for piri. we didn't realize this because we had a towel over it for over a year but we got rid of it a few months ago and realize that piri was slipping all over the place. yours look great! This one is definitely on the slippery side, too. I have one and like it as well. HOWEVER, the clip that holds the straps on the passenger side front seat has become "loose" and comes un-clipped sometimes, sometimes surprising my dog who has gotten used to not having to pay attention to the edge of the seat. I love the color! It looks to be really water resistant too. This might be a good present for a friend of mine who takes Bain on occasion while I'm at work. I went shopping with her the other day, and I said to her "Why is there white hair all over your seats? You only have black dogs." Took a moment for me to realize it was all of Bain's fur!